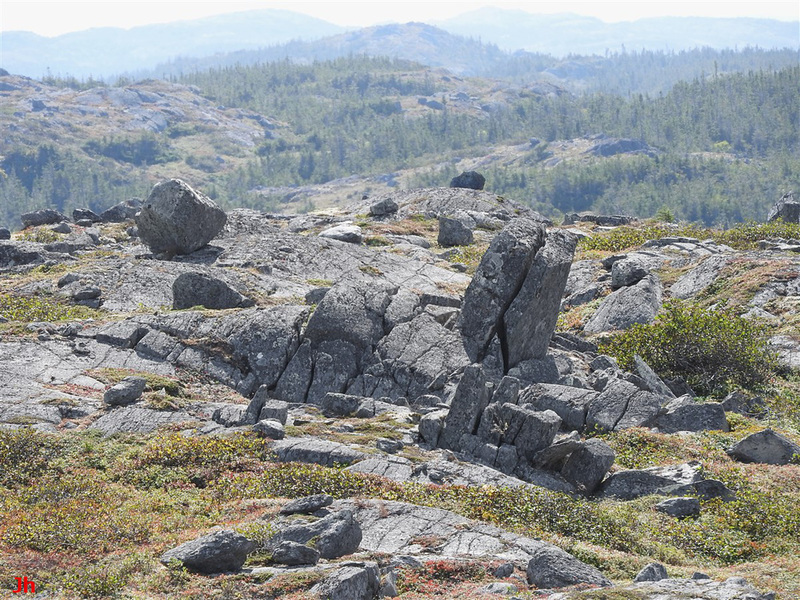 The frost-heaved monoliths shown in this group are mainly larger specimens found in a single locality where ice-induced bedrock disruption is particularly severe. While the detailed origin of the frost-heave features remains uncertain, the observations appearing below will be presented in the context of a model that incorporates three key elements: 1) Severe cold-climate conditions. 2) Nearly complete (but still ongoing) deglaciation. 3) Artesian groundwater. Note: The interpretations provided in this section were developed at an earlier stage in the Heart of Avalonia frost-heaved bedrock project and will be updated (pending) to conform with the subglacial ice plume model. 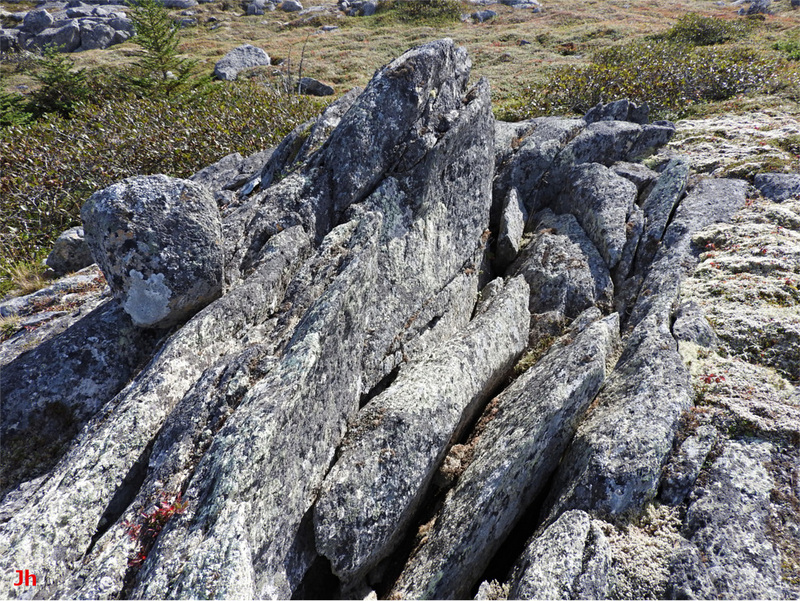 The above photo shows an unusually large frost-heaved monolith formed in schistose volcanic (subsequently metasomatized) bedrock. 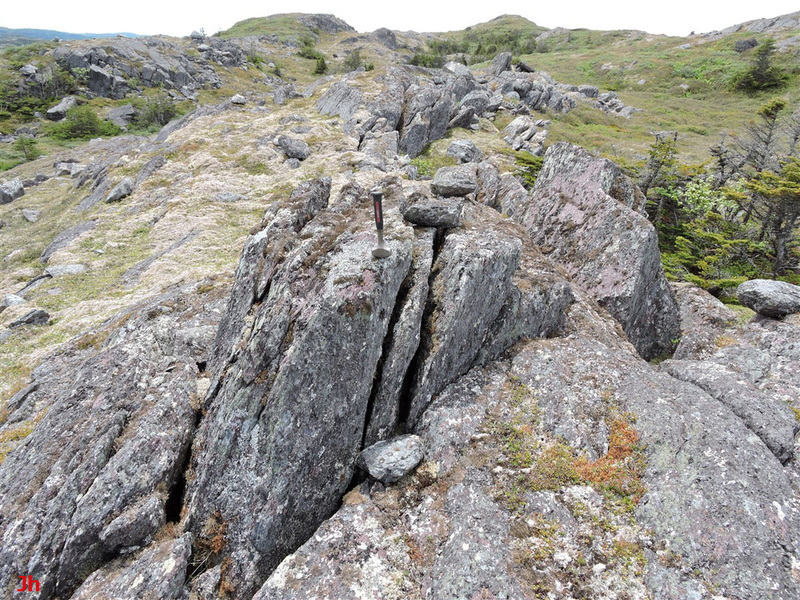 This frost-heaved monolith has been lifted about 1.7 m above the original level of the glacially smoothed precursor bedrock (center foreground). The dip angle matches the dip of the foliation in the host bedrock. A cross joint defines the side surface facing the camera. Four orthogonal views are provided below. As can be seen in the above views, most of the bedrock in the immediate neighborhood of the large monolith has been disrupted and pushed upward by frost heave. The central block stands out because it has been lifted up more than its surroundings. The measuring tape seen in the photo taken from the east direction is bent downward into a fissure. The depth of the fissure is 300 cm, of which 250 cm lies above the water table. The level of the water table approximately matches the level of the lake seen in the background. Measurements taken at a fissure at the west side of the monolith indicate that the initiation of frost heave beneath this feature took place at a depth of at least 3.6 m. The photo below shows an aerial view of the general location of the monolith described above. Two large frost-heaved monoliths are indicated by arrows in the above photo. The monolith (2) is the one pictured above in this section, while the monolith (1) is pictured as the fifth example in the section Frost-heaved Monoliths: Line Diagrams. These two specimens are located about 60 m apart and are similar in above-ground size and shape, as illustrated below. The two photos above are taken at approximately the same scale. 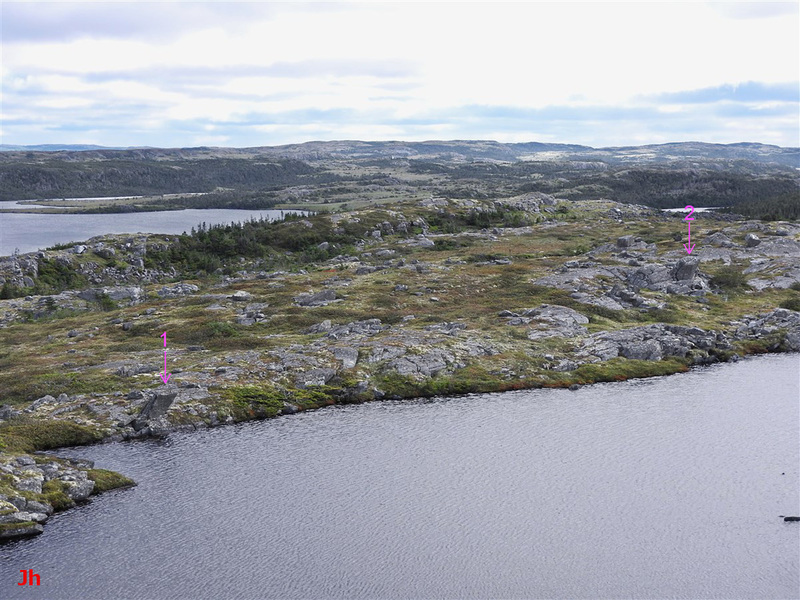 The foreground (moss-covered bedrock) visible in the photo (1) is 170 cm lower relative to the lake surface (present-day water table) than is the foreground (bedrock) visible in the photo (2). This suggests that the frost heave process more closely followed the topography of the surface rocks, rather than being governed by the level of a common water table. The present-day water table is determined by drainage patterns that would not necessarily match the drainage patterns existing at the time the monoliths were formed. The extent of frost-heave seen in a wider zone surrounding the illustrated features is exceptional, both in terms of the severity of bedrock disruption and in the unusual abundance of large frost-heaved monoliths. All of the remaining monoliths described in this section (Frost-heaved Monoliths: Examples-1) are found within a 1 km radius of the features illustrated above. Several observations from this localized and exceptionally frost-disrupted landscape fit within the hypothesis that artesian groundwater was a significant driver of the frost-heave process in this particular area. Three photos of a large cluster of frost-heaved monoliths are presented above. The first (upper left) photo was taken from north of the feature, while the second (upper right) photo was taken from a position north-west of the feature. The third (bottom) photo shows the group of monoliths as viewed from the east, looking west. 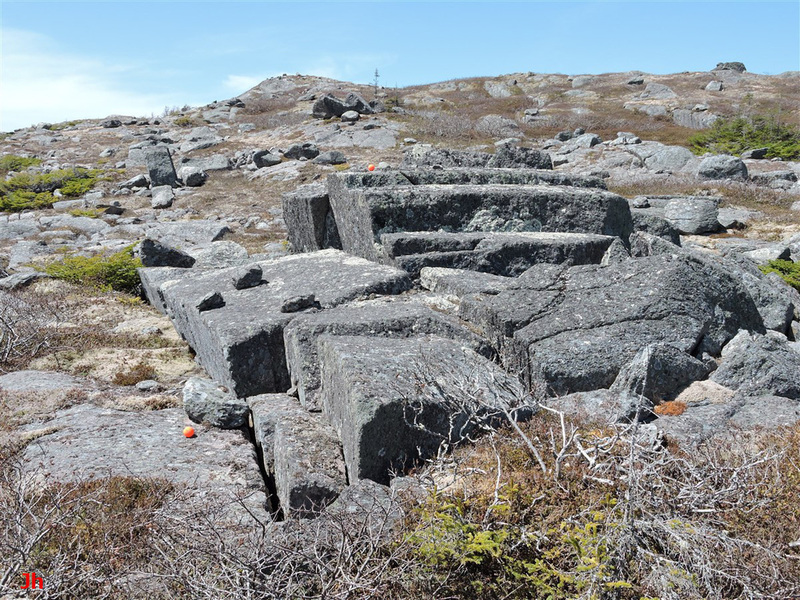 The bottom photo includes two small orange balls, the lower ball indicating the undisturbed plane of the original bedrock and the upper ball indicating a height of 1.5 m at the top of the feature. This feature stands out for the large total volume of bedrock displaced by frost heave at a single location. A copious groundwater source driving the process is indicated. At first glance, this feature could be misconstrued as a glacial erosion occurrence where blocks of bedrock were cleaved off along planes of weakness in a small hill. 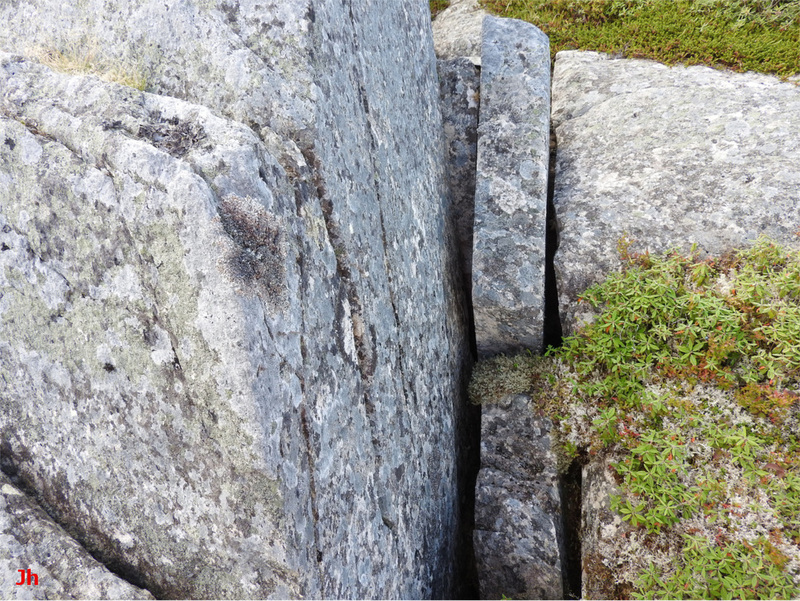 However, closer inspection shows large voids underneath the uplifted bedrock sections and an extensive set of fissures, indicating frost wedging. A fissure can be seen to the right of the lower orange ball in the bottom photo. 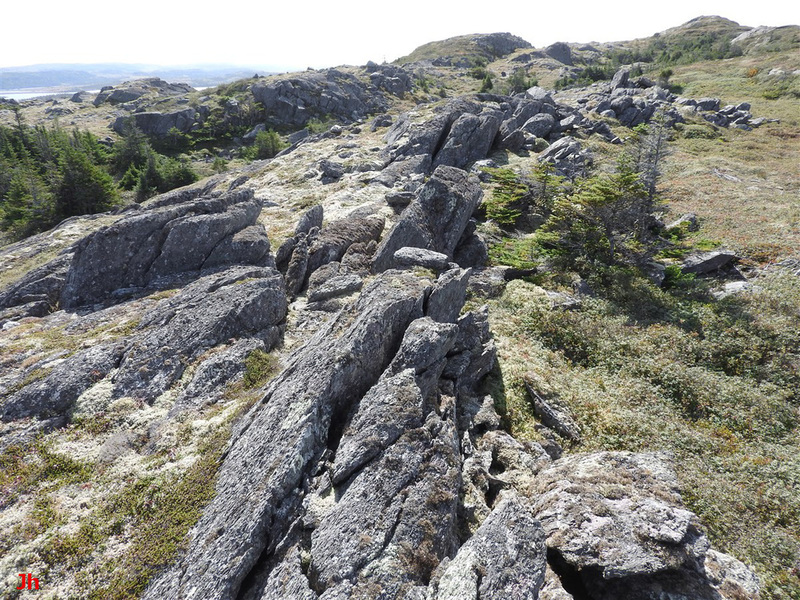 Wide slabs of frost-heaved bedrock are visible just forward and to the right of the main group of blocks shown in the second (top right) photo. These slabs are tilted at a steep angle relative to the near-vertical cleavage planes in the surrounding bedrock. The tilt occurs because the slabs have been frost-heaved almost completely out of the ground. 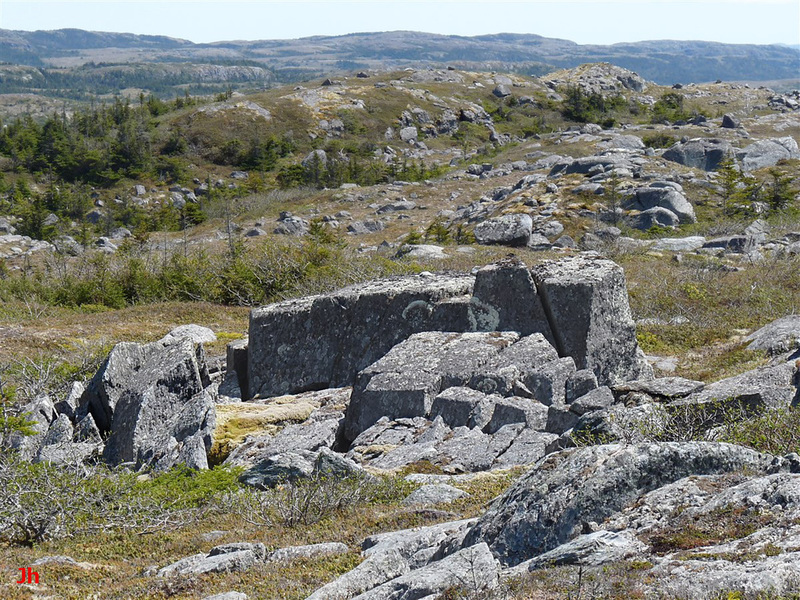 The cluster of frost-heaved monoliths pictured above lies in close geographic proximity (less than 70 m away) to a tall frost-heaved bedrock specimen shown previously (monolith 1, above in this section). The frost-heaved joint block pictured above clearly demonstrates the progression from basal-slip glacial erosion to frost-heave. 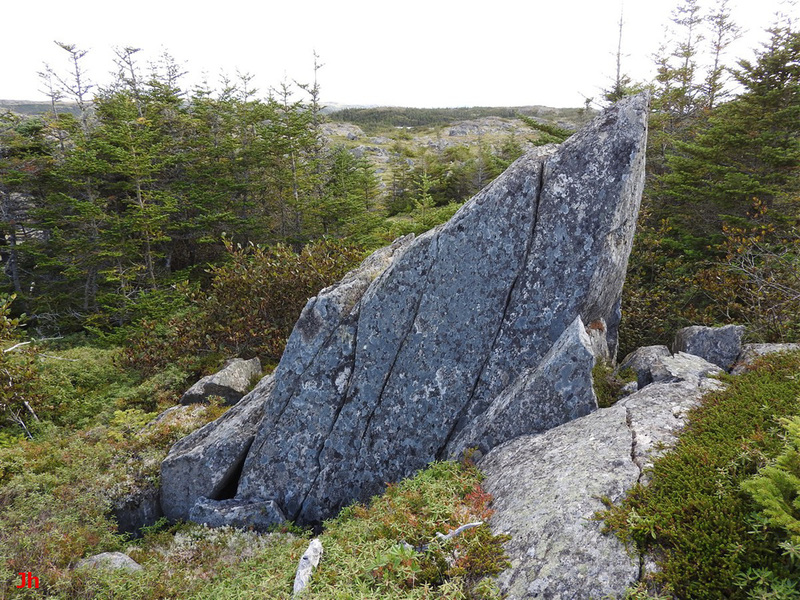 The original glacially-eroded bedrock surface is raised by 66 cm at the top of the specimen. The gently S-shaped shadow at the center of the first (left) photo above marks the edge of a frost-heaved monolith. An end-on view of this monolith is provided in the second (right) photo. The upper surface of the block is displaced 63 cm from the surrounding glacially-smoothed bedrock. The first (left) photo shows three large indentations in the smoothed bedrock, beneath and to the left of the frost-heaved block. The rock missing from these indentations has apparently been carried away by ice motion. The process responsible for dislodging the observed sections of missing rock involved failure of bedrock in tension on a down-ice slope and subsequent transport of the released fragments by moving ice. This process fits the broad definition of glacial plucking. 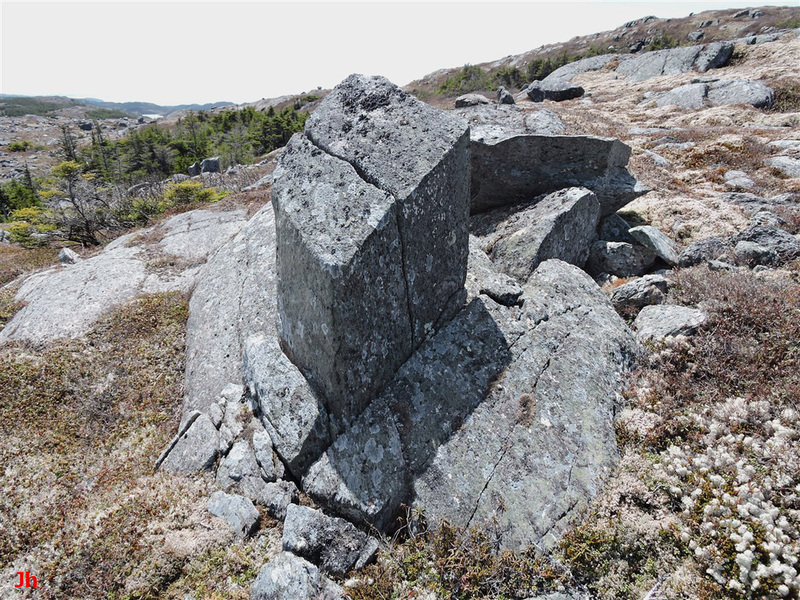 It could be inferred that this same "plucking" process, occurring at a similar time, might also have shifted (but failed to dislodge) the joint block that now appears as a frost-heaved monolith. The rock face seen above defines one end of a large, elongated frost-heave feature. 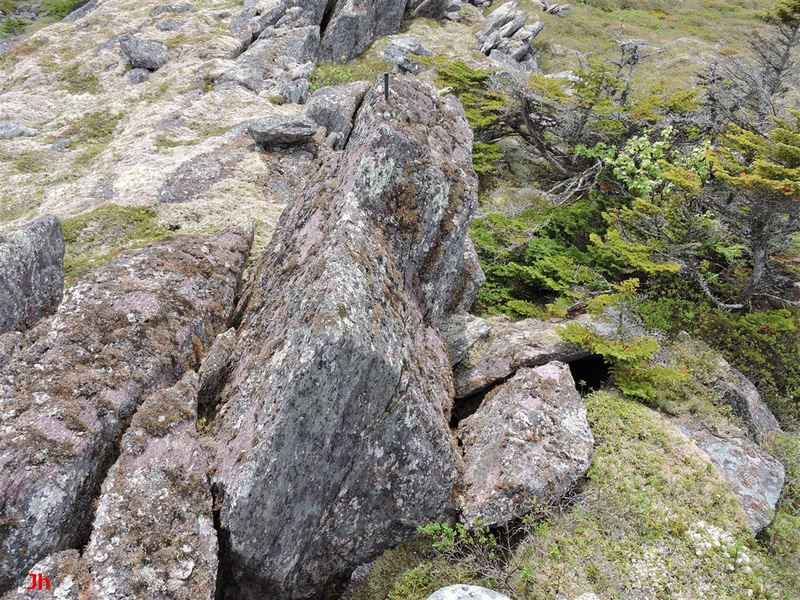 The top of the feature is about 1 metre above the lichen-covered foreground rocks (themselves frost-heaved) that are seen at the left of the photo. 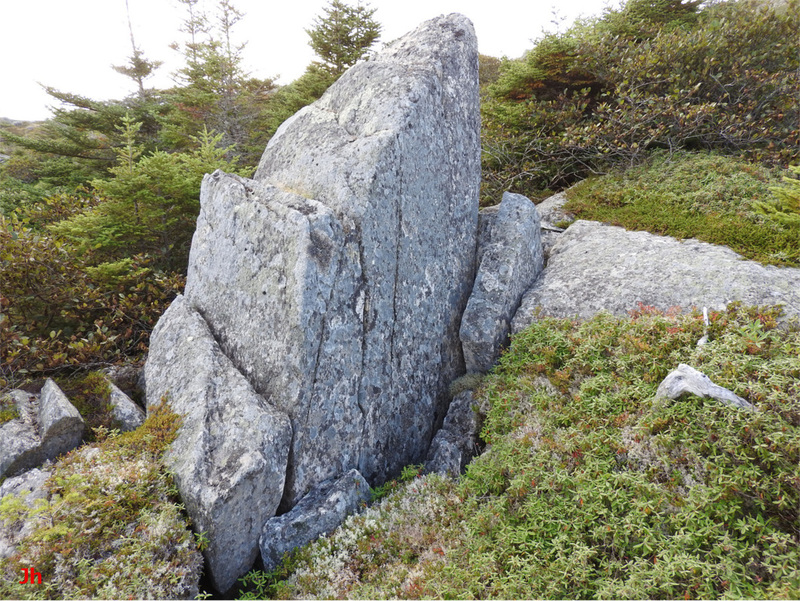 The deeply indented top surface of this heavily jointed monolith suggests significant ice-caused surface erosion (small-scale frost heave) in addition to the primary frost-heave event. Most of the fractured rock originally present in the indentations is missing, presumably having been carried away by ice motion. The photo below shows the same feature viewed obliquely from the opposite end. The above photo highlights the severity of the frost disruption in the precursor bedrock giving rise to this frost-heave feature. The short diagonal shadow appearing just below the center of the photo indicates a fissure. This fissure extends downward 170 cm, while the rock above the fissure extends upward 130 cm. The frost heave underlying this feature appears to have originated at least 3 m below the initial surface of the bedrock. 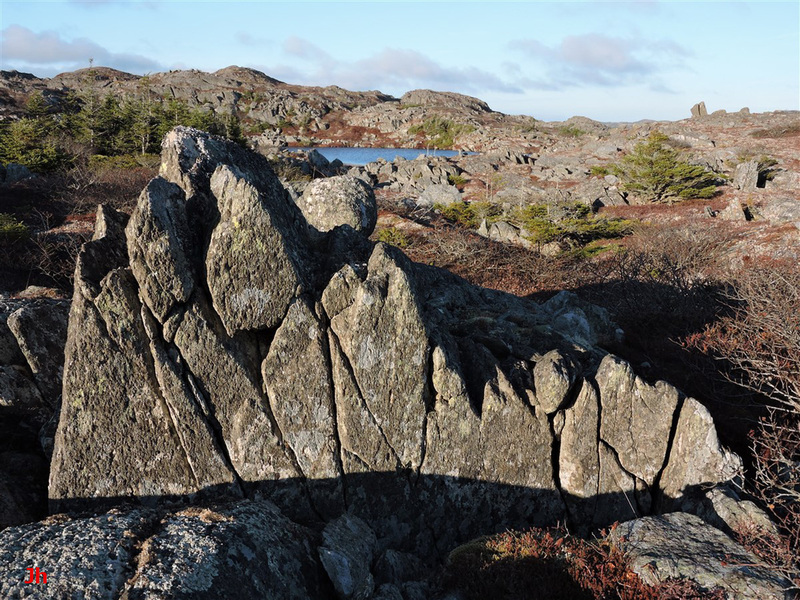 The presence of a glacially transported boulder (erratic), settled into a groove between ridges of frost-disrupted rock, is noteworthy. 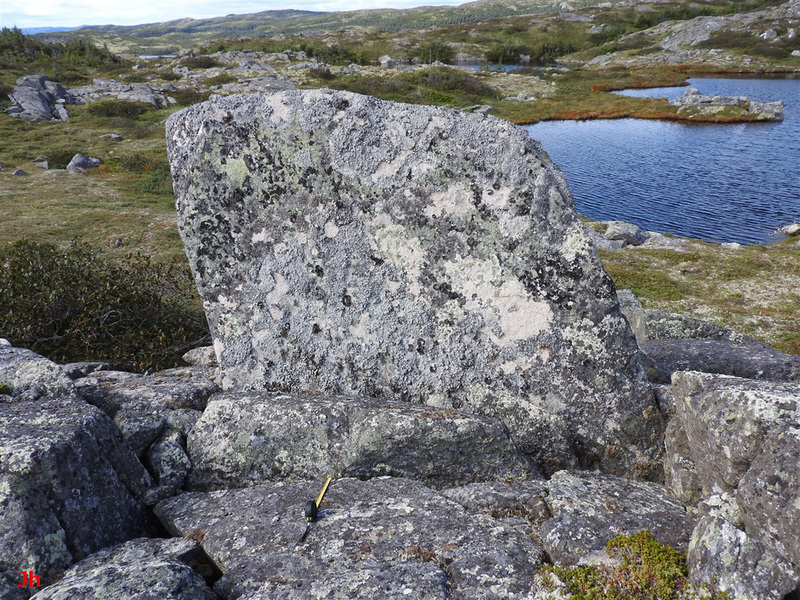 This boulder might have been present by coincidence before the frost-heave occurred, or it might have been deposited by thin, depleting glacial ice moving over the already-frost-heaved feature. 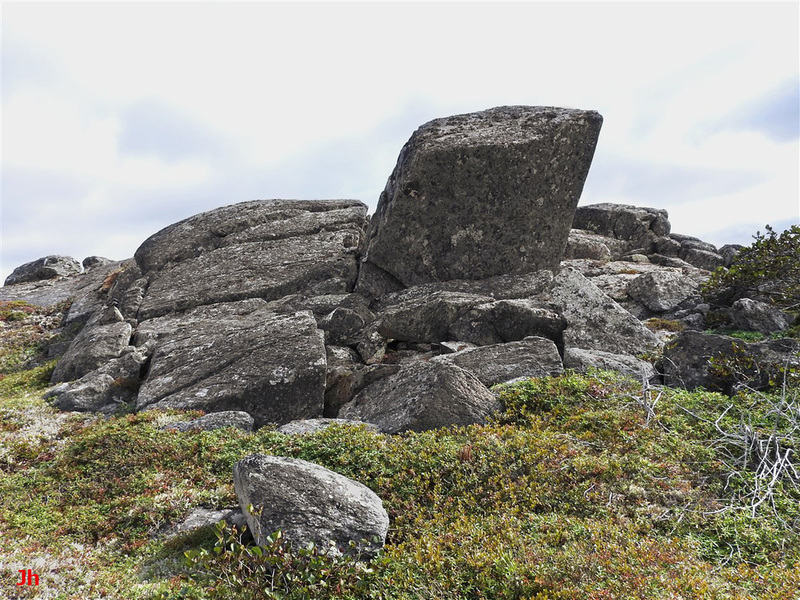 Based on the observation of rock missing from surface indentations (previous photo) and the presence of the erratic boulder strategically lodged on the frost-disrupted surface, a link between the bedrock frost-heave event and the concurrent presence of glacial ice could be implied. The extensive jointing seen in the rock (end-on view) might have provided a pathway for groundwater to move toward the surface. If the groundwater was pressurized by nearby glacial ice lying at higher elevation and the frost-heave event took place under glacial ice, then the observed feature could be interpreted as an example of "horizontal plucking" (see diagrams in Frost-heaved Monoliths: Introduction). 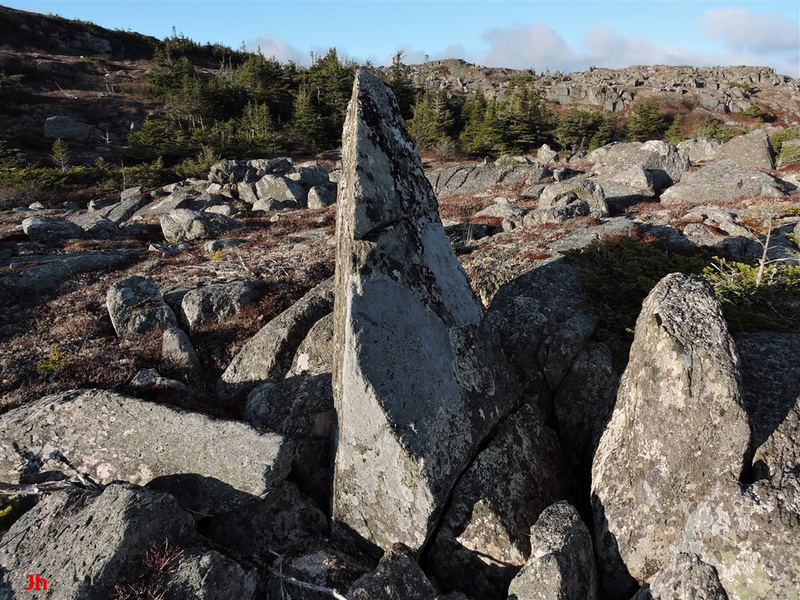 The tip of the tapered frost-heaved monolith shown above (two opposing views) extends about 1.8 m above ground level. The tapered shape of the block indicates that a significant section of rock is missing from the upper portion of the specimen. 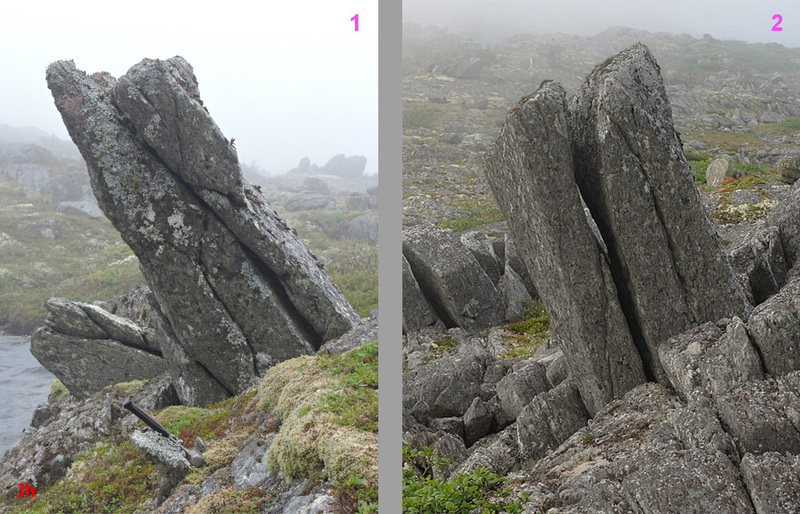 A large section of the missing rock is seen lying on the ground (left in the first photo, right in the second). 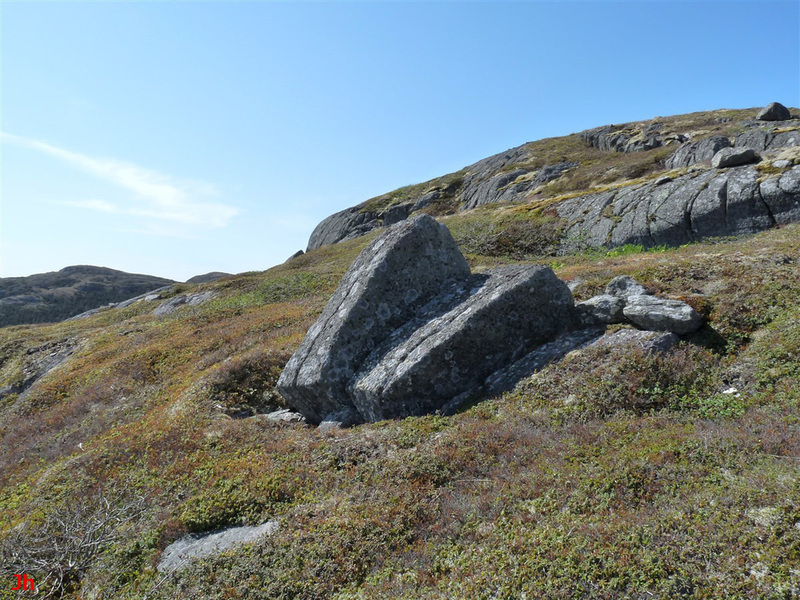 It is difficult to determine definitively whether or not the position of the fallen rock could have been reached through the unhindered action of gravity. 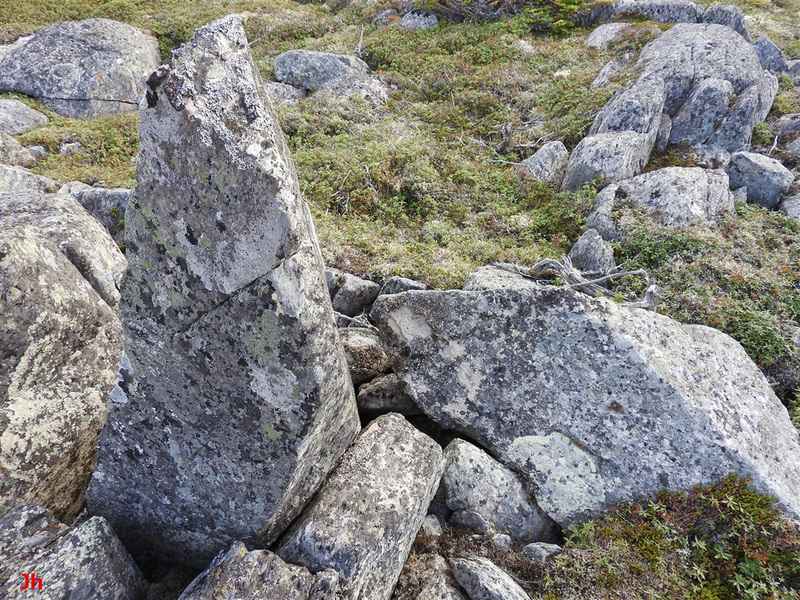 However, the general appearance of the layout on the ground suggests that bulk ice around the monolith interfered with the descent and position of the broken-off piece. This would support a model whereby the frost heave took place in the presence of glacial ice. 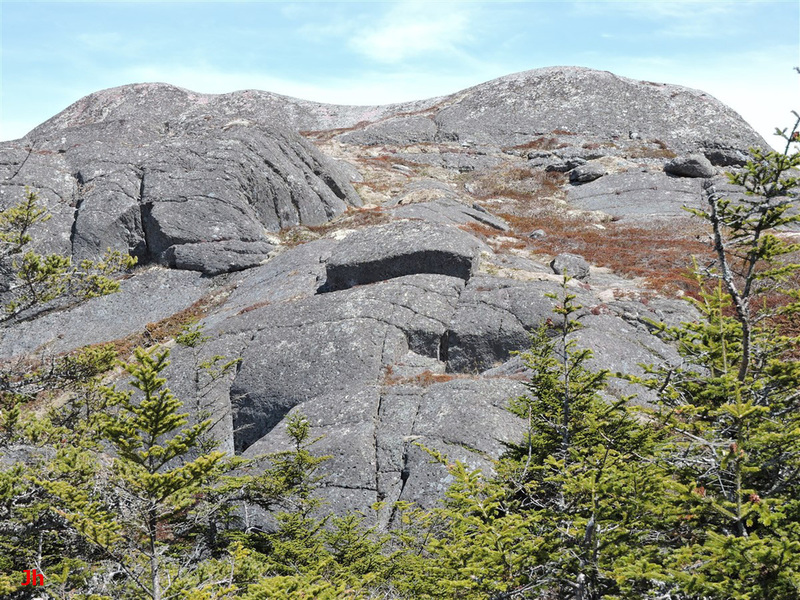 The five photos above show different views taken from a row of large frost-heaved bedrock occurrences. The entire row, illustrated in the top picture, is about 50 m long. 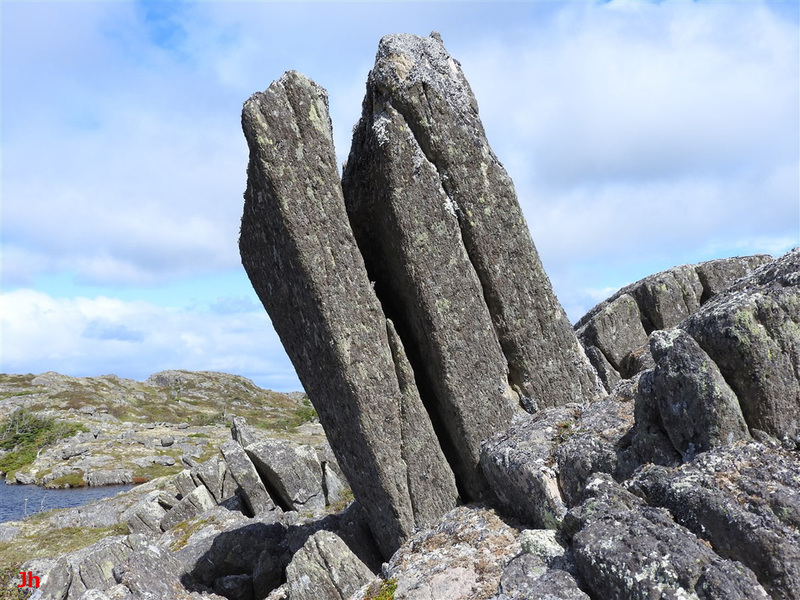 The hammer appearing in three of the photos is 27 cm long and the monoliths, on average, extend about 1 m above the surrounding bedrock. Although the ignimbrite (probably metasomatized) comprising the blocks is longitudinally foliated, a scarcity of distinct cross joints gives the blocks an irregular appearance. 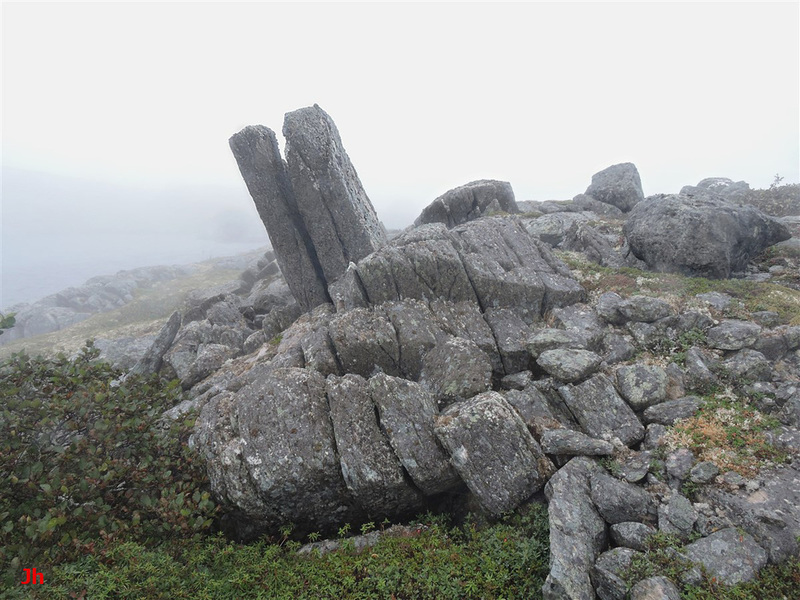 The bottom two photos show the same monolith, viewed from opposing directions. 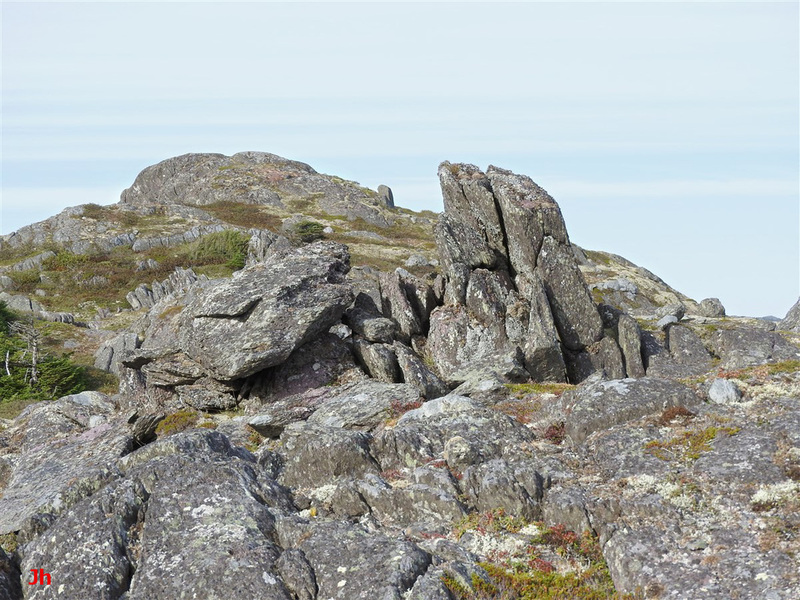 Note that a large slab of detached rock lies almost horizontally to the right of the monolith in the second last (bottom left) photo in the group. This slab is broken off from a base which can be seen clearly just below the front, left corner of the slab. 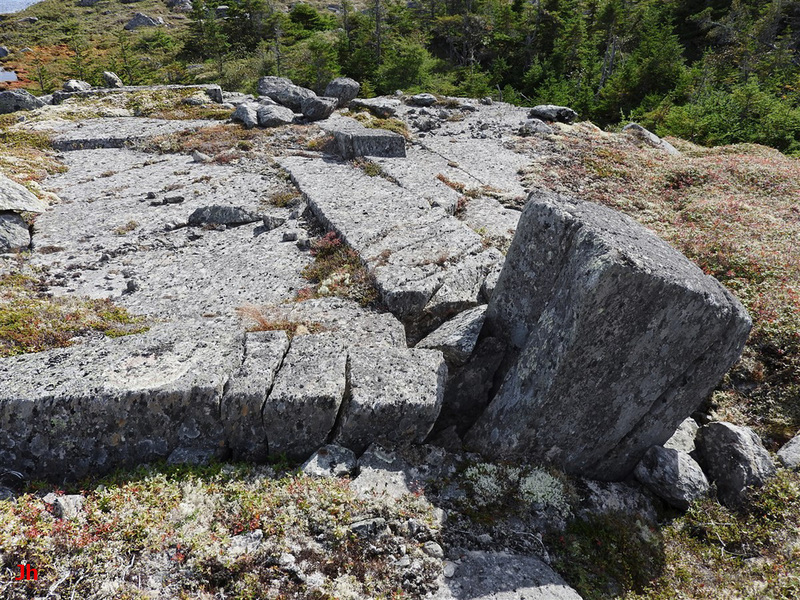 The slab is a toppled section of frost-heaved bedrock. An extensive set of deep (depth ~ 2 m) fissures accompanies the occurrence of frost-heaved blocks. The appearance of so many large frost-heave bedrock features closely spaced along a single line suggests a common origin for the features. One possible explanation is that groundwater forced upward through one or more closely-spaced longitudinal joints played a role in the development of these features. The above photo shows a bedrock surface that was first smoothed by basal slip glacial erosion, and then disrupted by bedrock frost heave. The side surfaces of the frost-heaved blocks follow a system of joints that were present in the precursor bedrock. The taller monolith at the front right of the photo is 70 cm high. This monolith sits at the intersection of two elongated frost-heaved blocks and its excess height could reflect an increased availability of groundwater at the point of intersection. An isolated large frost-heaved monolith is shown in the above photo. This feature is raised about 1.5 m above the level of the foreground bedrock. 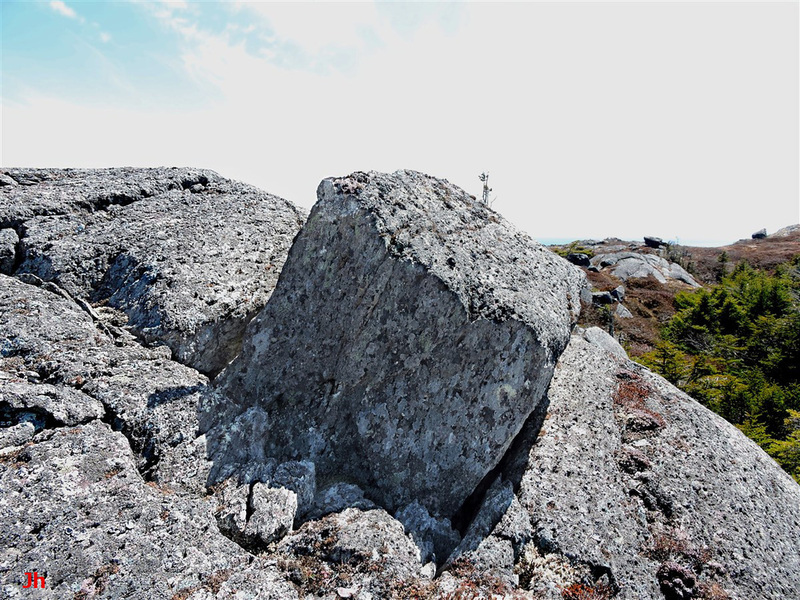 The two photos below show views of fissures and frost-displaced rock lying along the same side of the monolith that faces the camera in the above view. It is common for adjacent blocks of bedrock to undergo different amounts of frost heave, as seen above. 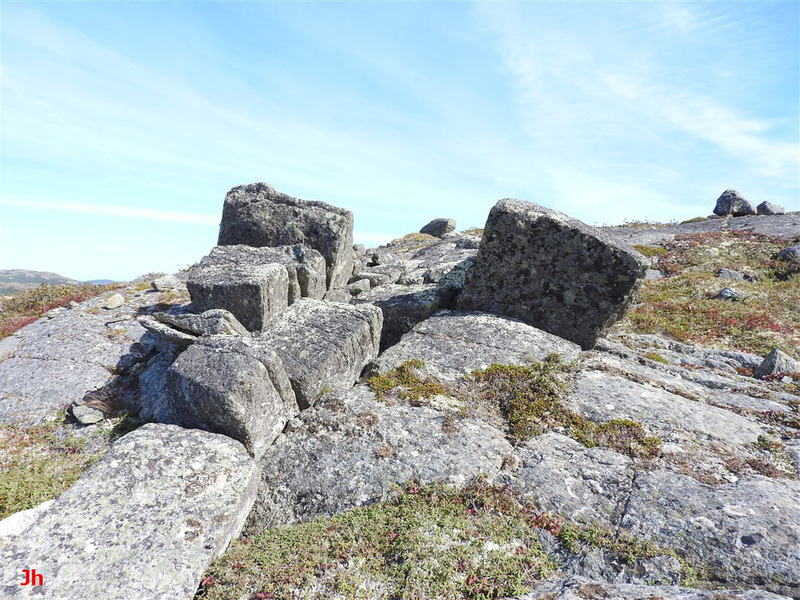 It is unclear whether the smaller blocks at the side of the main block experienced less uplift, or whether they were frost-heaved to the full height of the main block and then slid back to their present heights after the ice melted. The wide fissures alongside the smaller blocks make slip-back a reasonable possibility. It appears as though a large volume of rock was displaced laterally to accommodate the opening of the fissures. An example of differential uplift between two adjacent frost-heaved monoliths is illustrated above. 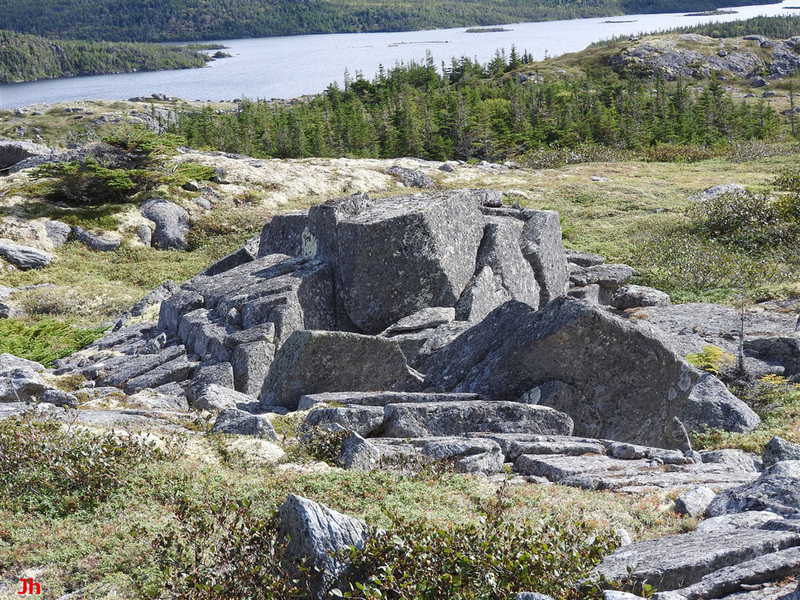 The top corner of the more strongly tilted left block is raised 1.3 m above adjacent bedrock. The blocks are 1.9 m long. The layout of this feature suggests that differences in frost heave, rather than rock slipping back, accounts for the different heights and slopes of the two components. This feature occurs at a significantly higher elevation than do the other large frost-heave occurrences presented previously in this section. If a common aquifer was supplying water to all of the frost-heave events in the local area, including this one, then the aquifer must have been pressurized. 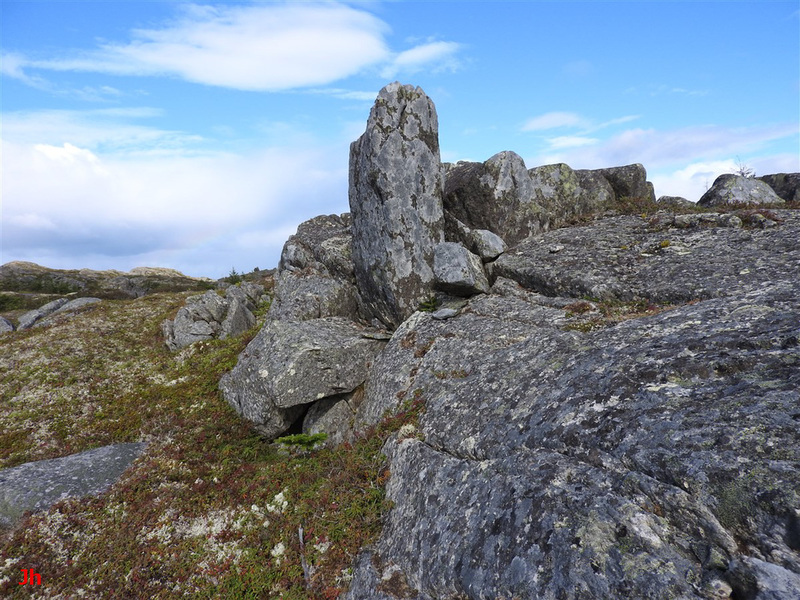 The predominant monolith seen at the edge of the low ridge pictured above is 1.4 m tall relative to adjacent bedrock. Four separate frost-heaved joint blocks can be seen behind (to the right of) the tall block, while one frost-displaced block lies in front (left). The front block is tipped at right angles to the others. It appears as though a frost-heave event comprised wedging the front block outward from the face of the ridge and lifting the other five blocks vertically. The possibility that the front block was also lifted vertically and then toppled into its present orientation is not supported by the layout of the blocks in this feature. The displacement of the front block implies loading by glacial ice moving right-to-left over the small ridge or else frost wedging occurring under glacial ice. Hybrid frost-heave occurrences such as seen above help tie together frost-heaved monolith development in this area and glacial activity. 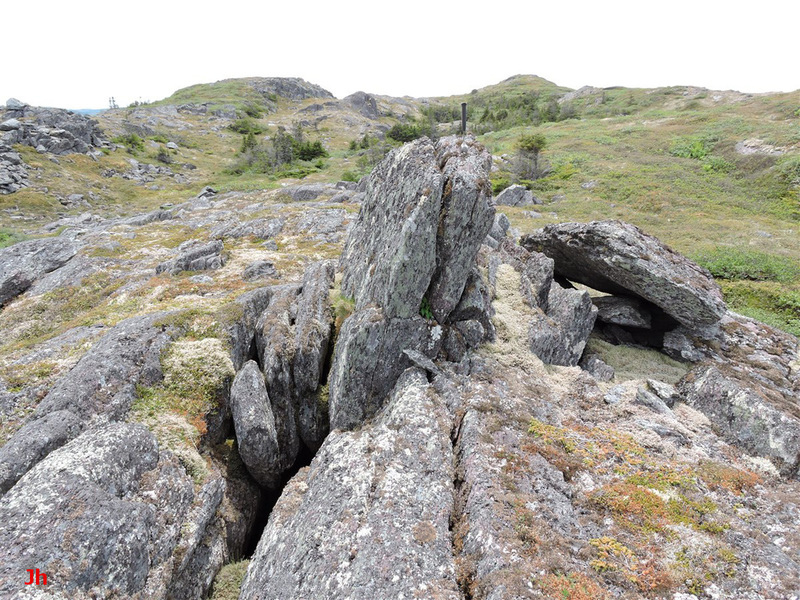 The monolith on the right of the group shown above is raised 78 cm above the surface of the bedrock seen in the foreground. This block extends downward a further 170 cm, yielding an overall length for the block of almost 2.5 m. The initiation of frost heave thus occurred at a depth of at least 2.5 m at this location. Nearby frost-heaved joint blocks show similar depths of initiation, ranging from 2.0 to 3.5 m. There are indications of frost heave having occurred beneath glacial ice cover in specimens observed near this location (see above). The thermal gradient needed to drive ice segregation becomes difficult to establish and maintain at a depth of more than 5 metres below the surface of glacial ice or the ground. It can thus be inferred that either glacial ice cover was thin when this deep-rooted frost heave occurred or that the frost-heave was initiated not by ice segregation, but rather by hydraulic pressure.